Syrian President Bashar al-Assad and his allies in Moscow and Tehran are continuing to complete the encirclement of Aleppo City despite an ostensible ‘cessation of hostilities’ that began on February 27, 2016. Russia resumed its air campaign against the opposition on February 28 following a one day hiatus, concentrating its strikes against the opposition-held northwestern suburbs of Aleppo City. Russia continued to target both Syrian Al Qaeda affiliate Jabhat al Nusra and moderate opposition groups indiscriminately despite an international agreement prohibiting strikes on non-terrorist factions. At the same time, pro-regime forces and their local partners continued to mount attacks aimed at securing favorable terrain in advance of future operations in Aleppo Province as previously forecast by ISW. The siege of Aleppo City – Syria’s largest urban center and commercial capital – would solidify the favorable position currently held by President Assad while sparking a humanitarian crisis that forces regional backers of the opposition to consider intensified interventions in the conflict. The regime and its allies have gained terrain around Aleppo City in recent weeks. The regime has leveraged a deepening partnership with the Syrian Kurdish YPG in order to pressure the only remaining ground line of communication (GLOC) to opposition-held Aleppo City. Pro-regime forces launched a failed attack from YPG-held territory against the villages of Shaykh Aqil and Qabtian al-Jabal northwest of Aleppo City on February 26, likely in an attempt to secure terrain that would form the outer cordon of an eventual encirclement of the city. The YPG later seized the Castillo Hill in the Sheikh Maqsoud District of Aleppo City on March 1 following clashes with Jabhat al Nusra and allied fighters, securing key high ground adjacent to the last remaining opposition supply route into the city. This advance suggests that the regime may intend to work with the YPG in order to close the four-kilometer-long gap required to isolate the opposition-held districts of Aleppo City. 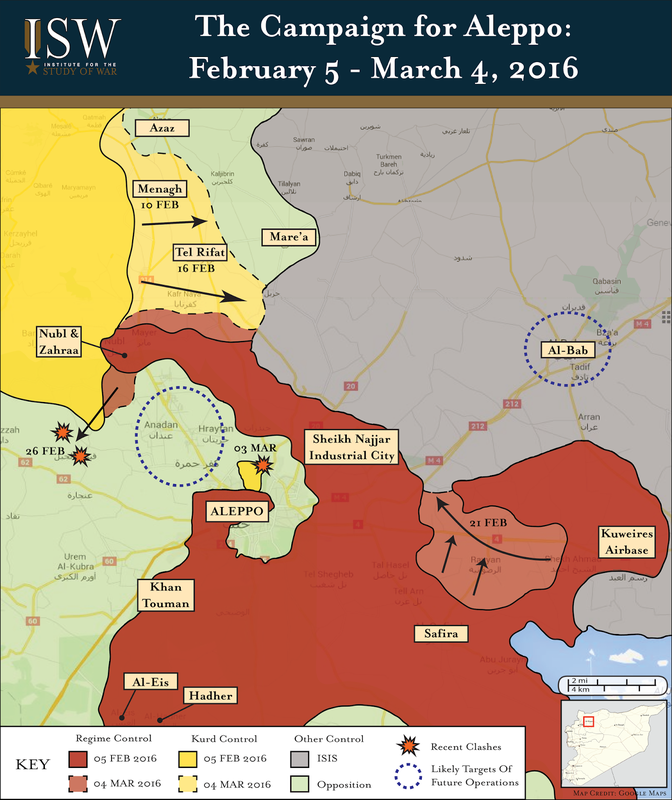 The Syrian Kurds previously engaged in similar battlefield coordination with pro-regime forces in early February in order to sever the primary opposition supply route between Aleppo City and Turkey. These gains will tend to drive the opposition closer to Jabhat al Nusra and other irreconcilable actors, further limiting the pool of local partners available to the U.S. The regime and its allies have sought to portray their actions as legitimate due to the battlefield presence of Jabhat al Nusra in some of these regions. These acts of aggression nonetheless threaten the long-term survivability of the wider opposition in Aleppo City. Riyad Hijab – the head of the opposition High Negotiations Committee – warned on March 3 that the ceasefire stood on the verge of collapse, stressing that “the regime and its allies continue to violate the truce and launch operations to gain more ground” at the expense of the opposition. The regime and its allies ultimately remain willing to secure additional battlefield gains rather than demonstrate any signs of goodwill in advance of the Geneva Negotiations scheduled to resume on March 9. The current ‘cessation of hostilities’ thus stands to mark only a lull in the ongoing conflict that provides the regime and its allies with an opportunity to replenish and refit their forces ahead of a renewed offensive that besieges Aleppo City and decisively shatters the primary nexus of opposition strength in Northern Syria.